digital touchscreen or your smartphone. Access and control your coach’s many features with the OneControl mobile app! 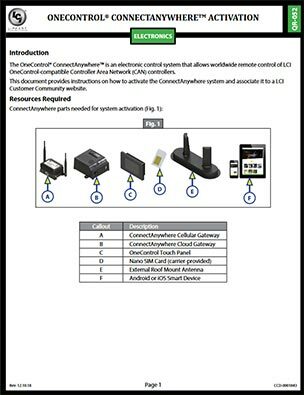 When using the OneControl app with OneControl ConnectAnywhere™ or OneControl Wireless™, you have the internet connectivity needed to control and monitor your coach’s many accessories and systems. Your browser does not support MP4 Format videos or HTML5 Video. 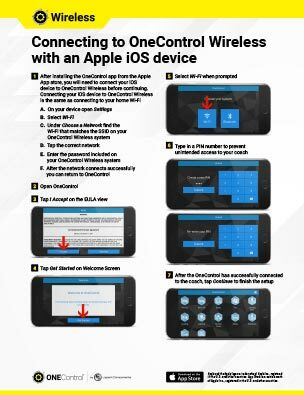 OneControl’s Getting Started Guides provide you with the setup and how-to information you’ll need to connect your OneControl-equipped RV with the OneControl mobile app. Features & FunctionsWhat can OneControl do for you? Product ComparisonWhich system is right for you? *Only “safe” functions can be controlled remotely with ConnectAnywhere technology. User cannot move slide-outs, levelers, jacks, awnings, etc. remotely for safety reasons. Is Your RV Equipped With OneControl? Wireless units denoted with a "+ ConnectAnywhere Prep" are ready to upgrade to ConnectAnywhere. ConnectAnywhere UpgradeIs your unit prepped to upgrade? 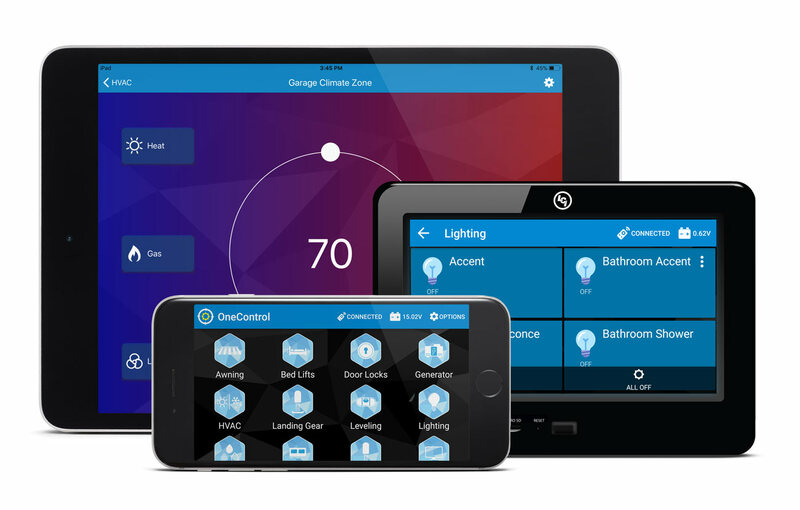 Certain 2019 models can be upgraded to OneControl’s ConnectAnywhere technology, adding a 4G LTE hotspot while allowing you to control and monitor certain RV functions anywhere you have a cellular connection. Stream your favorite movies, play online video games, or simply stay connected anywhere the road may take you with OneControl ConnectAnywhere. Need some help? For troubleshooting or product information, contact us!